Cheetahs in Namibia get a bad rap as hunters of cattle. Farmers - whose land accounts for 95 percent of the cheetah habitat - will kill the vulnerable felines, fearing the animals pose a threat to their livestock. But a new study in the journal PLOS One aims to absolve the cheetah - these cats prefer eating wilder cuisine than domestic cows, say researchers from German and Swiss universities and the WildCat Foundation. With respect to cheetah predation, a "farmer's problems are smaller than they had assumed before this study," states Christian Voigt, a scientist at the Leibniz Institute for Zoo and Wildlife Research in Germany. 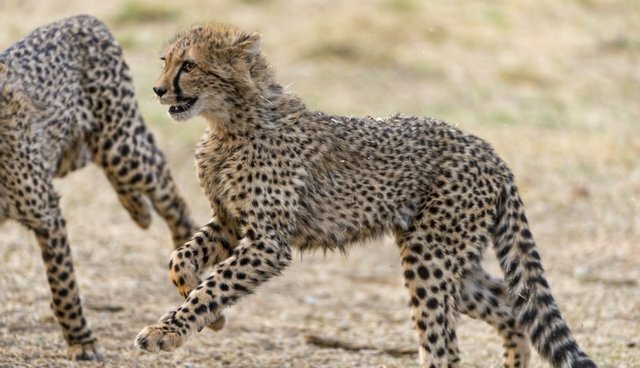 To determine which species makes up the wild cheetah menu, Voigt and his colleagues tracked the amounts of nitrogen and carbon molecules in blood and tissue samples from 53 cats, as well as those in potential cheetah prey. (The wild cheetahs were captured, fitted with radio collars and released.) Nitrogen and carbon isotopes travel up the food web, from plant to herbivore to predator, in different frequencies. By looking at these molecules, the scientists could get a sense if cheetahs ate grass-grazing animals - like cattle - or if the cheetah diet was made up of springbok antelope and other smaller mammals who munch on shrubs and herbs. Throughout Africa, large feline predators are often regarded as threats to livestock as well as human lives. But disease and drought, not big cats like lions, are the major loss of life to cattle. That doesn't mean cheetahs and lions aren't frequently killed in response to livestock deaths - perhaps because these predators make easier targets than fighting illness or a lack of water. To prevent ranchers from seeking revenge on big cats, one solution is to build barriers called bomas, which keep cats and cattle separate. "Each fortified boma protects around 200 head of livestock, they're almost 100 percent effective," Amy Dickman, the director of the Ruaha Carnivore Project tells National Geographic, "and we've seen an 80 percent reduction in lion killings in the areas where they're being used." Likewise, the researchers of the cheetah study hope that this information can be shared to decrease the number of cheetah deaths. But, the scientists stressed, they're not anti-farmer. "We understand their position," says Bettina Wachter, an evolutionary ecologist at the Leibniz Institute. "The concepts of species conversation always need to be balanced against the livelihood of humans."